Volvo Trucks has looked into the future of long-haul big rigs and sees a hybrid. The Swedish manufacturer, which owns the Mack brand in the U.S., is testing its first hybrid truck to see how much fuel it will save on long-haul deliveries. The vehicle is expected to produce 30 percent less CO2 emissions than a comparable truck. The hybrid is part of a growing movement within the trucking industry to design more fuel efficient and less polluting alternative powertrains. Other manufacturers are developing electric and hydrogen fuel-cell trucks. When using Volvo Trucks’ new hybrid system, drivers should see fuel savings between 5 to 10 percent. The hybrid powertrain shuts off the combustion engine when it’s not needed, which amounts to about 30 percent of driving time. A kinetic energy recovery system recaptures energy lost during braking or when driving downhill on a slope of more than one percent. The energy is then stored in the hybrid’s batteries until needed for flat roads or low gradient driving. The new hybrid powertrain uses Volvo Trucks’ I-See program, taking data from GPS and electronic maps to analyze the driving topography and ensure the most efficient combination of power is used. 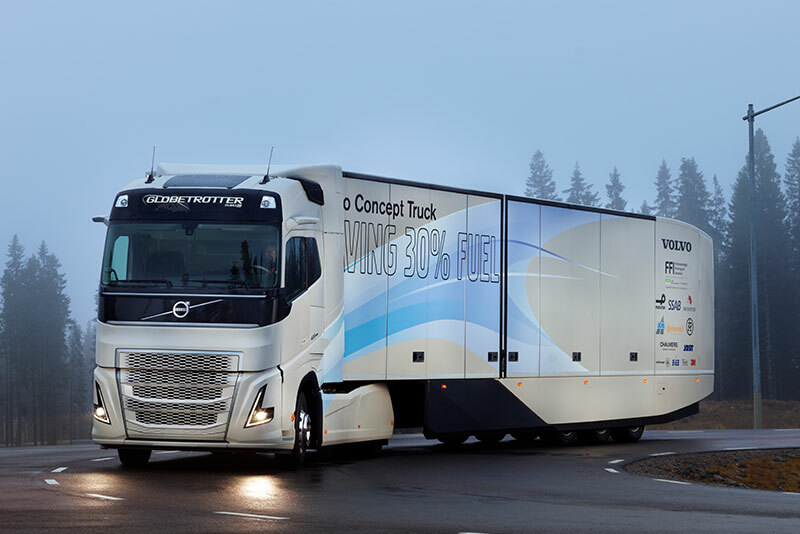 The hybrid, or Volvo Concept Truck, is the result of the Swedish part of a bilateral research project involving both the Swedish energy authority Energimyndigheten and the U.S. Department of Energy. Other truck makers are jumping into alternative powertrains. 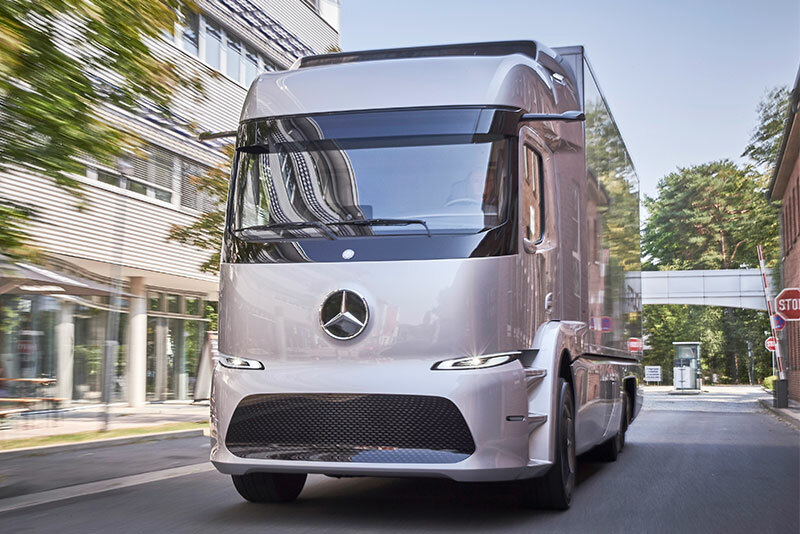 Last month, Mercedes-Benz said it was starting testing of a series of electric trucks for the delivery of goods in urban areas. It will have a range of about 125 miles. 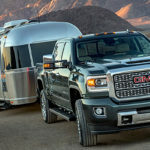 Buchner said the truck will initially go to customers in Germany – and later elsewhere Europe too. Elsewhere, Salt Lake City startup Nikola Motor Co. is developing a hydrogen fuel cell long-haul truck. Nikola is developing the Nikola One, a zero-emission, hydrogen-powered electric truck boasting a range of 800 to 1,200 miles while carrying a full load of 65,000 pounds without stopping at a hydrogen fueling station. The hydrogen-electric hybrid truck will use a 300kW fuel cell as well as a 320kWh battery bank that will provide backup energy and help the truck with high-torque situations and hill climbing. Last year, Toyota Motor Corp., said it was considering developing is own a heavy-duty fuel cell truck. The Japanese automaker has formed a special team within Toyota’s U.S.-based research and development unit to work on a fuel cell electric powertrain for use in a heavy-duty, or Class 8 truck. It already is building hydrogen fuel cell buses and forklifts, as well as the Mirai passenger sedan. Another firm, which began development around 2010, was claiming mileage improvements of up to 35% around 2014. Their hybrid powertrain rebuild kit uses a series concept, similar to a diesel-electric locomotive. We do have solution for power train with ultra fast rate. 30C for charge and 50C discharge . we applied on GTG crane in Hong Kong and china . it cut off 65% Fossil and carbon footprint . look forward adapt to Heavy duty truck and Locomotive and Marine application as well .